Think adoption is out of reach because of the expense? Overwhelmed with how to raise the funds? Join us for a webinar with adoptive mom and author Julie Gumm. Whether you’re a parent or church ministry, come learn ideas to take the “impossible” out of adoption cost. 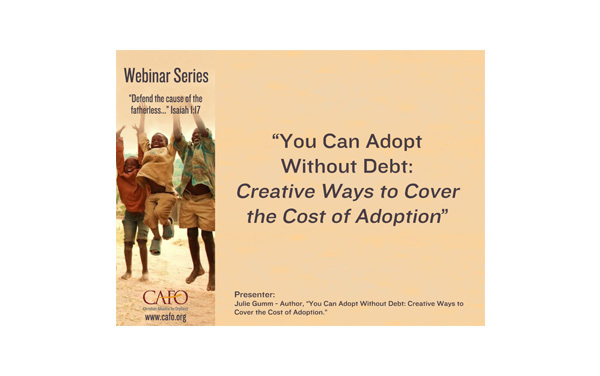 Packed with practical information on budgeting and grants as well as tons of creative fundraising ideas, this webinar will encourage you and get you on the road to debt-free adoption. It can be done! We’ll also include some ways that churches can come alongside adopting families as they raise funds.